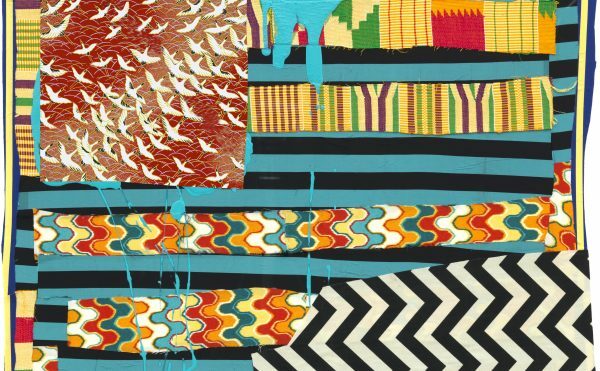 PHILADELPHIA — It should come as no surprise that there are many ways one can experience art. 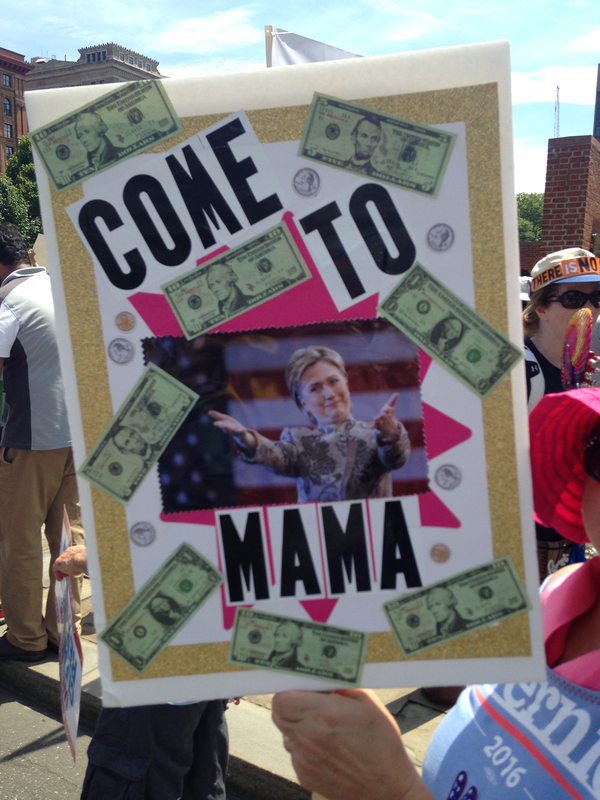 During this week’s Democratic National Convention, the opportunities run the gamut, from the pristine gallery and museum to the street protest. In my review for Hyperallergic Weekend last Saturday, I wrote about Do You, Ms. Jones? at the Rosenwald-Wolf Gallery. With works by Pope L., Liz Magic Laser, Zoe Leonard, and many others, this show turns an astute eye towards some of the most relevant and troubling issues of our time, drawing attention to white supremacy, shallow free-market individualism, and leaders who are driven by self-interest rather than the common good. The gallery, which is part of University of the Arts, is a good place to look at art, but it is also typical, clean, and orderly, with a feeling of quiet. The museum at the Pennsylvania Academy of Fine Arts (PAFA) is similar, and is offering a comparable experience to its current visitors. Happiness, Liberty, Life? American Art and Politics, which runs through September 18, presents an array of political, even polemical art. As part of the show, PAFA has resurrected an incomplete version of pop artist Red Grooms’ “Philadelphia Cornucopia” (1982). 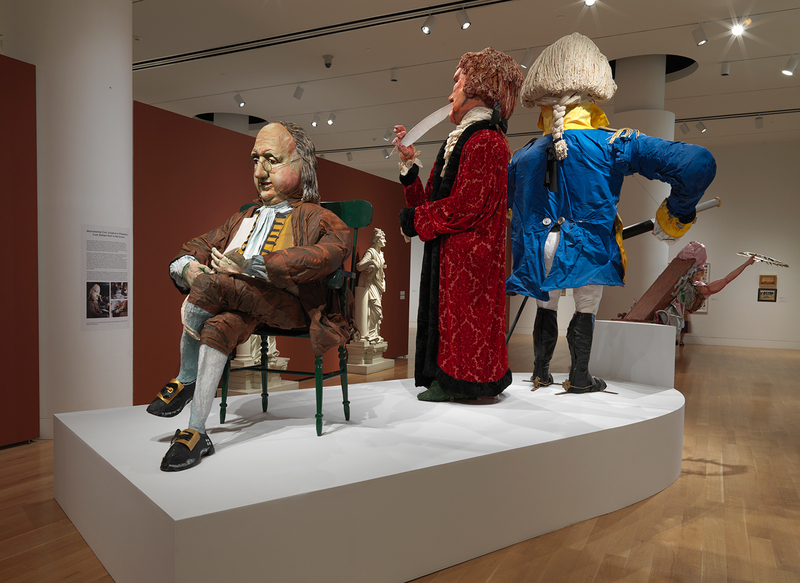 This “sculpto-pictorama,” which consists of oversized sculptures of George and Martha Washington, Thomas Jefferson, and Benjamin Franklin aboard a ship, was originally made for the city’s tricentennial in 1982, but until 2010 had been sitting in the basement at City Hall. It required extensive restoration to bring the work back to life, but even in this diminished scope, the sculptures inspire the wry smile one often associates with Grooms’ work. 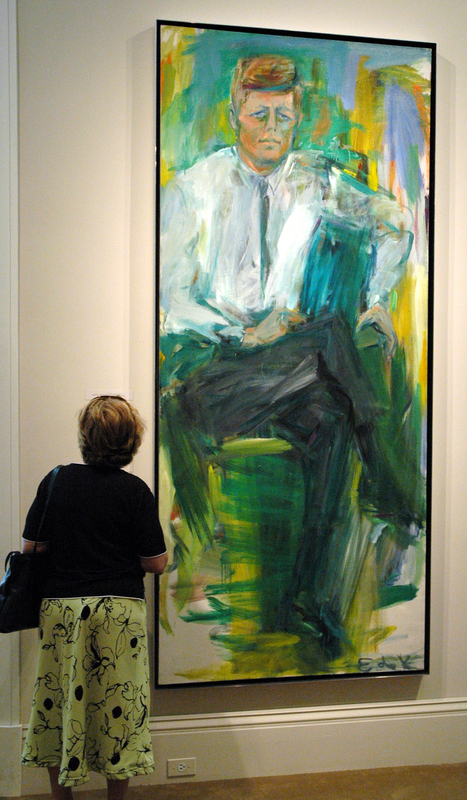 Elaine de Kooning’s “John F. Kennedy” (1963), in contrast, has an air of melancholy. How much of that feeling stems from his assasination and the tumult of the 1960s? A lot of it, probably. In the portrait, the president looks as if he’s about to get up, in spite of his weary eyes and posture. As the painter recounted in an interview excerpt in ARTnews, she spent considerable time preparing for the commissioned portrait by observing the president during meetings, sketching him whenever she saw him in the media, and sitting down with him to familiarize herself with his posture. But Kennedy was hardly ever still. He “read papers, talked on the phone, jotted down notes, crossed and uncrossed his legs, shifted from one arm of the chair to another, always in action at rest.” De Kooning’s portrait depicts the president as hard working and deserving of our respect. Harris — along with photographers Zoe Strauss and Richard Ross, also represented in the show — uses his subversive work to provoke hard questions about our culture and laws. 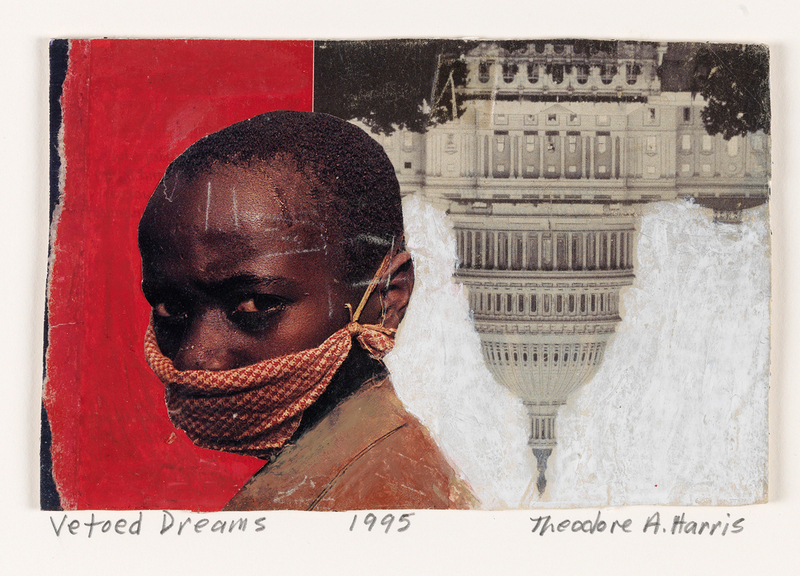 In “Vetoed Dreams,” Harris depicts a young African American boy with his mouth covered by a cloth gag and the United States Capitol building upside down in the background. As Ari Berman points out in his recent book Give Us the Ballot: The Modern Struggle for Voting Rights in America, there has been a concerted right-wing effort to repeal parts of the Voting Rights Act of 1965, which prohibited racial discrimination in voting. In this context, “Vetoed Dreams,” with its subtle violence, becomes a visual record of the erosion of African Americans’ civic achievements since the Civil Rights era. 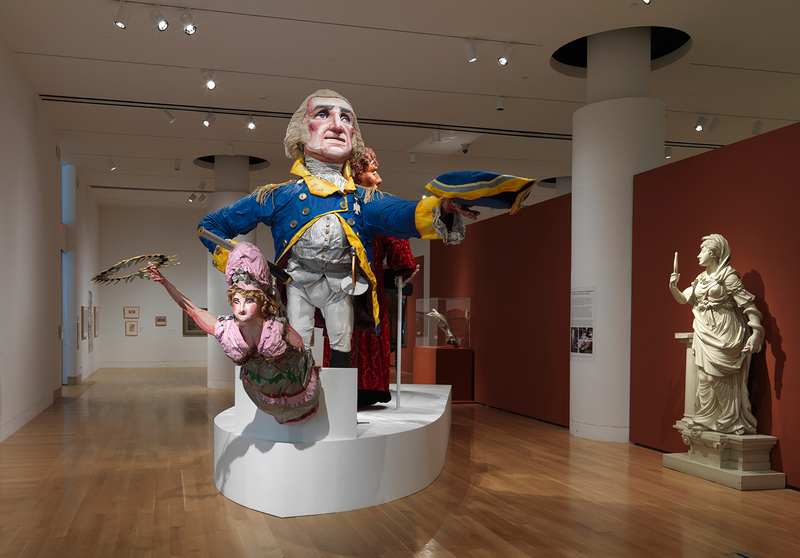 In more traditional spaces for art, like Rosenwald-Wolf and PAFA, art that deals with politics isn’t always “political art.” Grooms’ work seems to be having some fun with the legacies of America’s founders, but it isn’t going to send visitors out into the streets demanding change. De Kooning’s portrait of JFK was commissioned and so her finished painting connotes the respect she was expected to deliver. Harris’s work, however, is polemical. He wants his viewers to ask questions, to feel anger and disappointment. It’s an admirable aim, but one wonders how it’s affected by a space that assures visitors they are seeing Art, with a capital A — and a space where there is air-conditioning. Throughout the city, where temperatures have reached the high 90s this week, there have been a number of raucous protests thus far. None of those that I’ve attended have had what some readers might normally consider art, and most people who would attend a protest aren’t there for the signs or the puppets. However, the cross-section of visual expression at these events can display many of the same techniques — humor, drama, and rebuke — used by the gallery and museum artists discussed above. 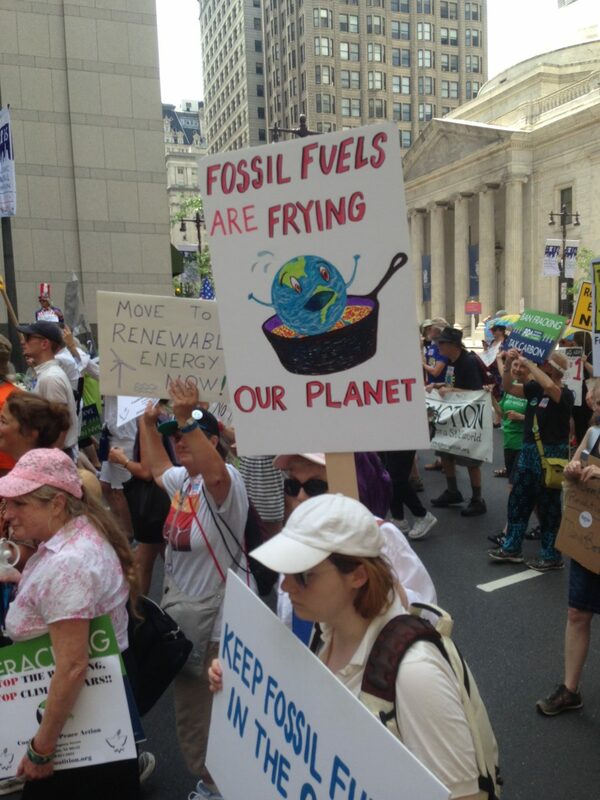 On Sunday, at the March for Clean Energy, just one day after the controversy surrounding Debbie Wasserman Schultz and the leaked DNC emails, protestors were already carrying signs demanding she be fired. 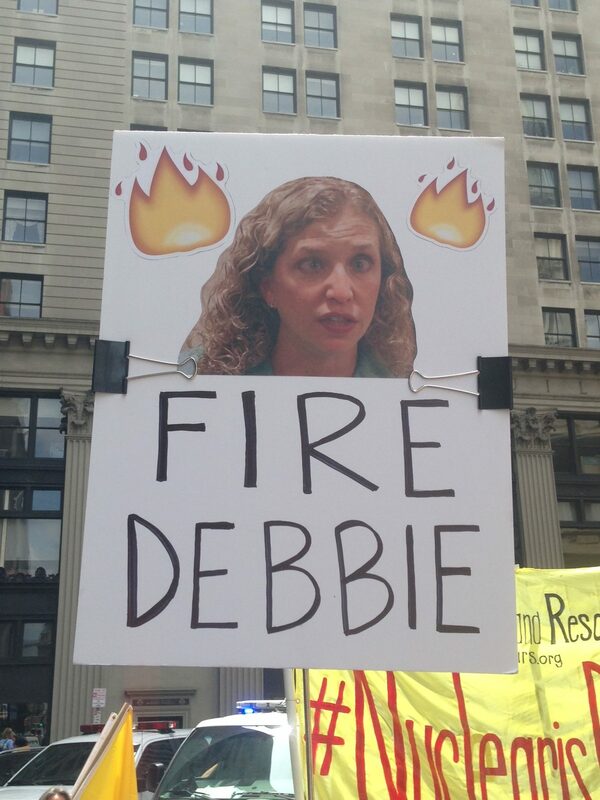 One sign consisted of a cross-eyed Debbie and some flames made of paper cutouts. The sign’s pure mockery captured people’s attention for a moment, but it wasn’t particularly artistic. 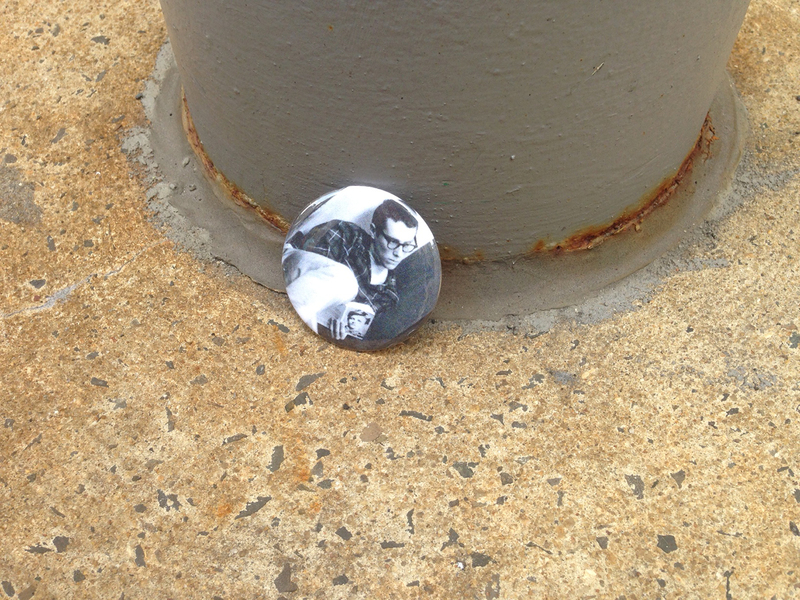 At one point during this march I looked to the ground and noticed a pin with a photo of a young man sitting against a wall reading the French poet Arthur Rimbaud. 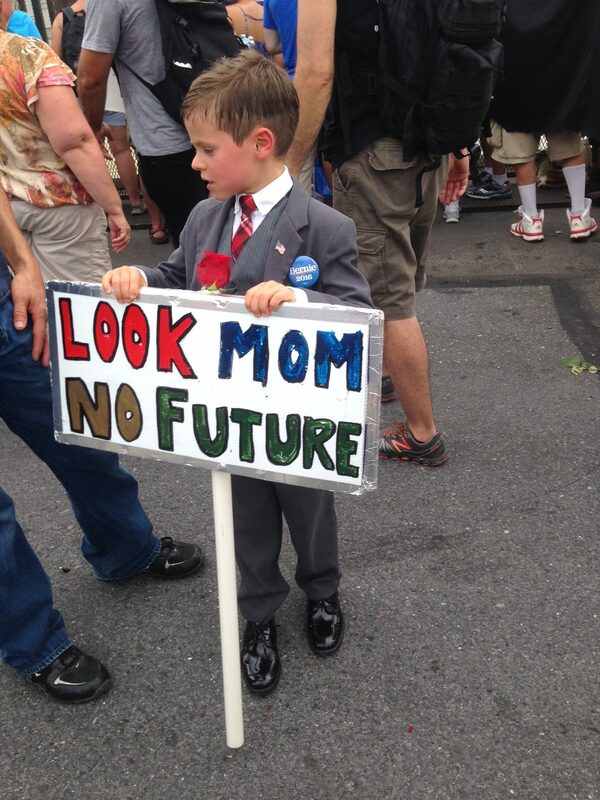 On the internet a few months back, there was much discussion of whether this was a young Bernie Sanders. It’s hard to say if it is Sanders, but it’s not an image worth idolizing anyway. After quitting poetry at the age of 19, Rimbaud became a gunrunner and slave trader in Africa. Similarly troubling are the T-shirts I’ve seen throughout the city this week that have Bernie’s face superimposed on the iconic image of Che Guevara that has been commodified by stores like the Gap over the years. It’s important to remember that Guevara was a murderer; Sanders isn’t. With the idolization of Rimbaud and Guevara, it seems that there are numbers of people who either don’t know their history or have simply chosen to ignore repugnant behavior in favor of commodifying them as simply leftists and therefore good. The right is, of course, just as selective with some of its versions of history. 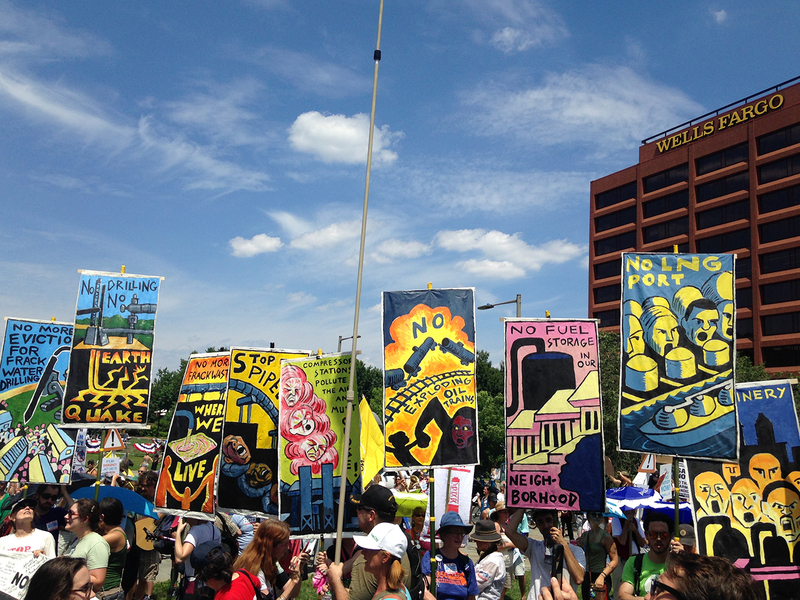 When the March for Clean Energy finished, the daughter of Berta Cáceres spoke at a rally held on Independence Mall. Cáceres was a Honduran activist who was murdered in her home in March of this year. She was co-founder of the Council of Popular and Indigenous Organizations and a recipient of the Goldman Environmental Prize in 2015. In response to her death, It Takes Roots to Change the System People’s Caravan has protested at both the RNC and now the DNC in an attempt to raise awareness of US involvement in Honduras. 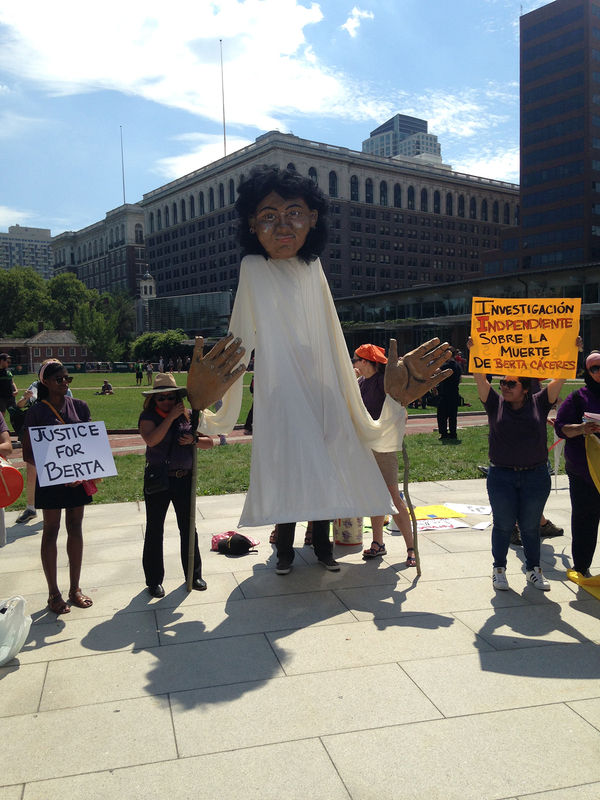 As part of their entourage, they carry with them a giant puppet of Cáceres and occasionally chant, “Berta didn’t die, she multiplied.” Throughout the march this large-scale version of Cáceres seemed to float above the crowd, conveying a sense of calm. My three-year old daughter actually refused to call it a puppet, saying that the figure was alive, that it was actually Cáceres. As I sit here thinking about the variety of visual expression in some of the galleries and streets of Philadelphia right now, I keep coming back to Harris’s belief that art is what we use to get to the “bottom” of complex issues. Grooms’ cartoonish “sculpto-pictorama” doesn’t solve any of the problems created by the oversized mythology of America, but neither does the effigy of Cáceres eliminate the pillaging of the environment. While the intentions and motivations of both works are undoubtedly different, as art they draw our attention away from what’s immediately in front of us. They ask that we look up and pose some questions, and if we deem it necessary, take action. And it would be better if this action were in the name of someone like Cáceres rather than Guevara. Happiness, Liberty, Life? American Art and Politics continues at the Pennsylvania Academy of Fine Arts (Samuel M.V. Hamilton Building, 128 N Broad Street, Philadelphia) through September 18.